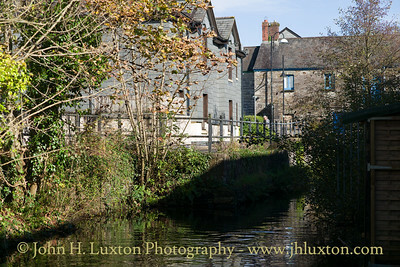 The Tavistock Canal was constructed early in the 19th century to link the town of Tavistock to Morwellham Quay on the River Tamar on the Devon and Cornwall border, where cargo could be loaded into ships. Outbound cargo included ore from local mines and mineral lodes were explored and exploited during the construction of Morwell Doan Tunnel. 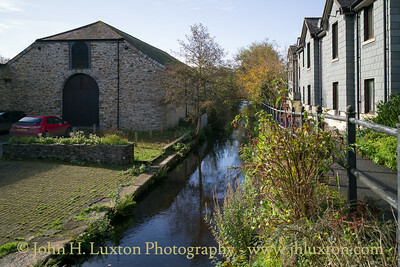 Though closed to navigation by around 1880 the canal has found a second life supplying water to Morwellham Hydro Electric Power Station and forms part of the Cornwall and West Devon Mining Landscape World Heritage Site. 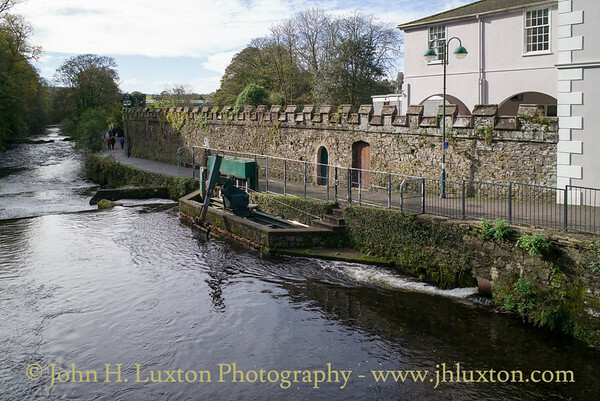 The main line of the canal starts at the Abbey Weir in Tavistock, where water is taken from the River Tavy. 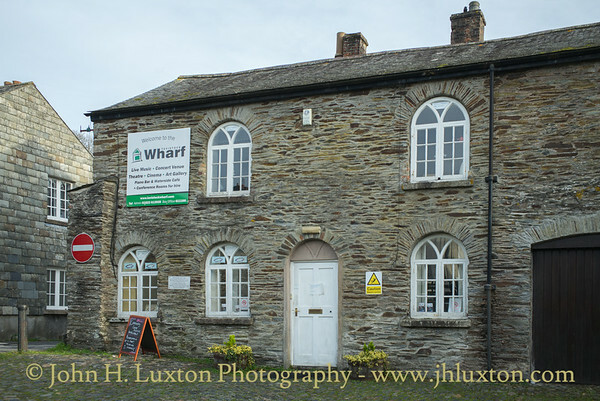 Passing through wharfs in Tavistock, it proceeds towards Morwellham Quay in a fairly straight line, with a large horseshoe loop when it meets the valley of the River Lumburn, which it crosses by a large aqueduct. The two-mile Mill Hill branch turned off immediately after the aqueduct. After about 3 miles (4.8 km) the main line reaches the northern portal of the Morwell Down tunnel, which emerges 1.5 miles (2.4 km) later above the quay. A short length of canal after the tunnel brought boats to the top of the inclined plane which provided a link down to the Port of Morwellham. 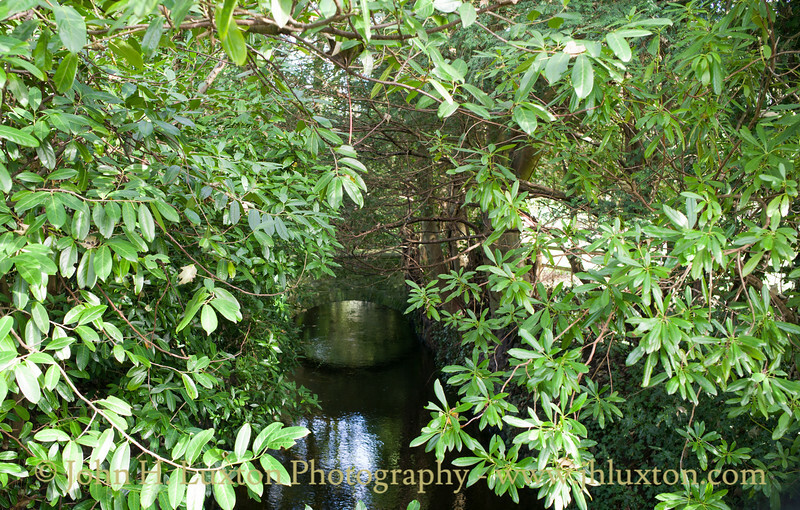 "My mind flows like a river - where does it all go?" 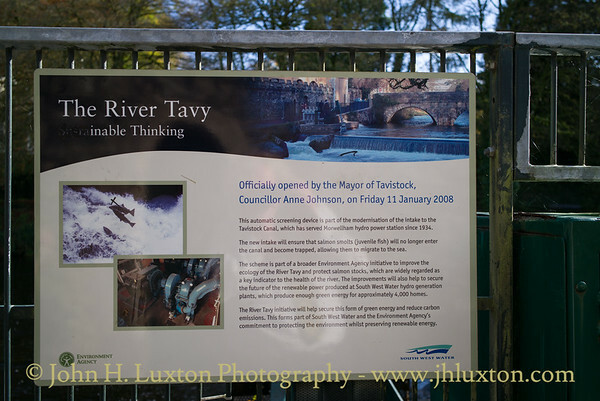 The commencement of the Tavistock Canal at Abbey Weir, Tavistock. 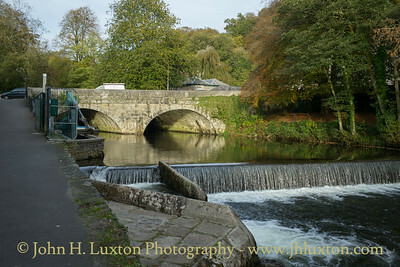 Abbey Weir Tavistock. 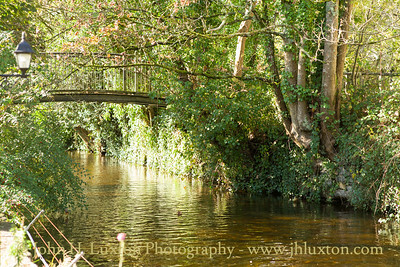 The Canal commences on the left which the fence surrounds an automatic dredging device designed to keep the feed clear. 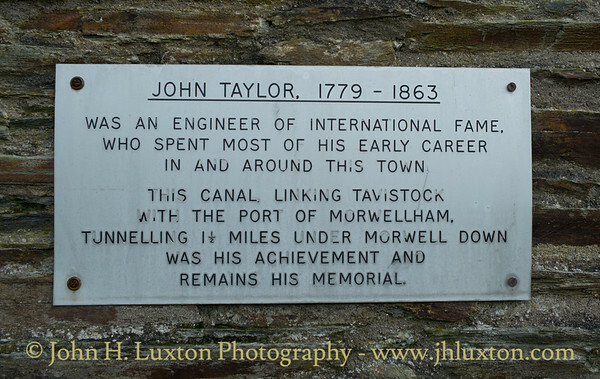 Plaque commemorating Civil and Mining Engineer John Taylor - the canal's engineer on cottage 2 at Tavistock Wharf. The granary warehouse straddles the canal. The low air draught iron canal boats could pass under what appears to be quite a low bridge to berth under the warehouse whose floor was removable for cargo handling. When the canal closed the warehouse became a furniture store until 1930 when it was sold to the Girl Guides who still operate from the building. Just under the bridge a water main pipe can be seen, obviously this was not in place when the canal was operational. 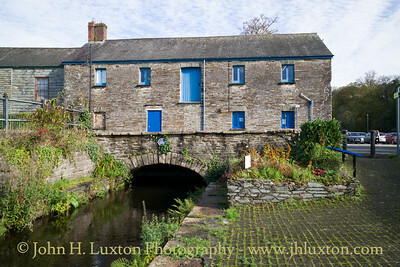 The granary warehouse straddles the canal. The low air draught iron canal boats could pass under what appears to be quite a low bridge to berth under the warehouse whose floor was removable for cargo handling. When the canal closed the warehouse became a furniture store until 1930 when it was sold to the Girl Guides who still operate from the building. 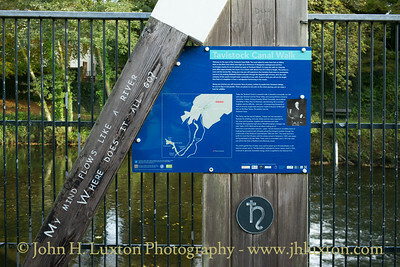 Tavistock Canal where is passes through Meadowlands Park. 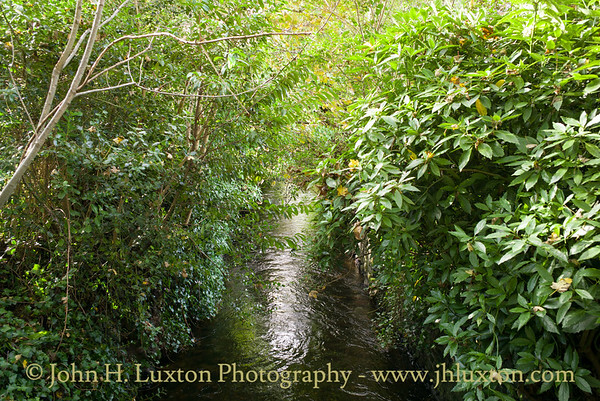 The Tavistock Canal feed at Abbey Weir on the River Tavy at Tavistock. A robotic excavator arm regularly operates to prevent debris and small fish entering the canal. The arm's completely automatic operation often attracts the attention of passers by on the river side footpath and nearby road bridge. 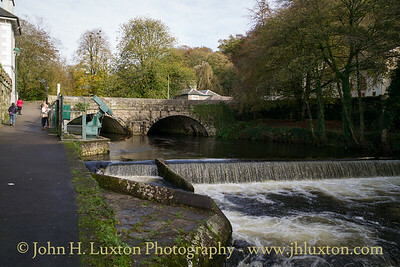 The automatic screening device at the River Tavy Abbey Weir intake of the Tavistock Canal prevents debris and and small fish entering the canal. 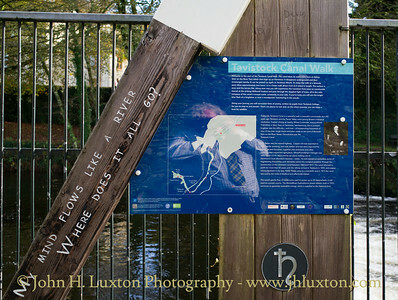 The Tavistock Canal entrance at Abbey Weir on the River Tavy at Tavistock. A robotic excavator arm regularly operates to prevent debris and small fish entering the canal. The wall once surrounded Tavistock Abbey. 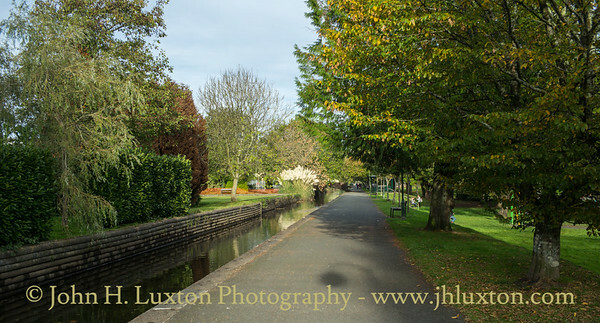 The Tavistock Canal feeder channel which leads from the Abbey Weir to the Wharf mainly through the grounds of the Bedford Hotel. The wharf outside the Wharf Cafe-Bar looking down stream. The strange low level fence is to keep the fowl from the canal off the patio area of the bar. Looking up stream from the Wharf cafe - bar part of the Wharf Leisure Complex looking towards the Granary Warehouse which straddles the canal with the blue framed windows. 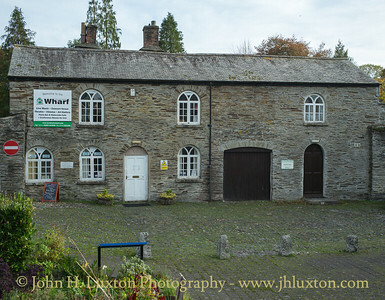 The modern entrance to "The Wharf" leisure complex which uses the former coal warehouse. 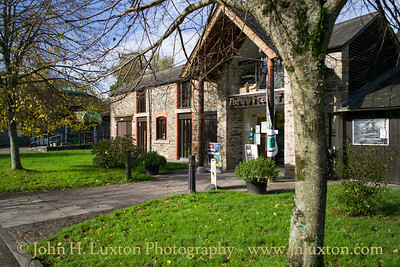 The complex offers a cafe bar and cinema / theatre space within the historic buildings. The north end of the coal warehouse. 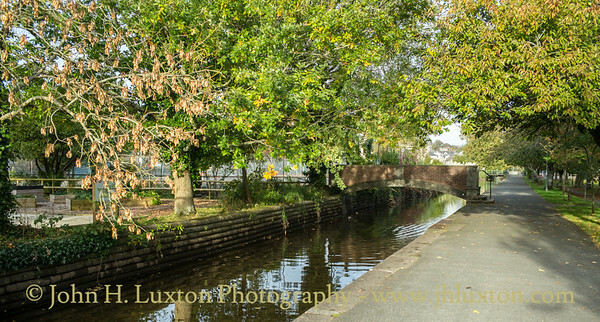 This was operated by Gill & Company - one of the major promoters of the canal. A plateway is believed to have operated through the warehouse entering through the arched doorway. The interior now houses a cinema / theatre and a cafe-bar which has canal side seating. 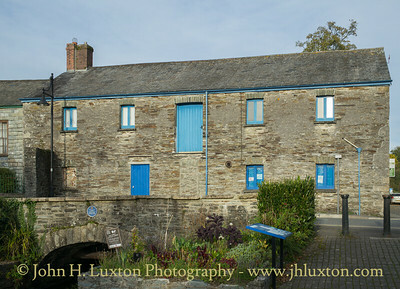 In the foreground is Gill & Company's Wharf The public wharf was on the side occupied by the modern housing. 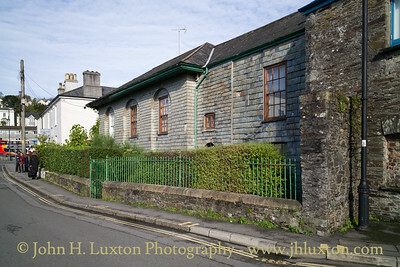 The Tavistock Canal Company Offices which are now two private houses. 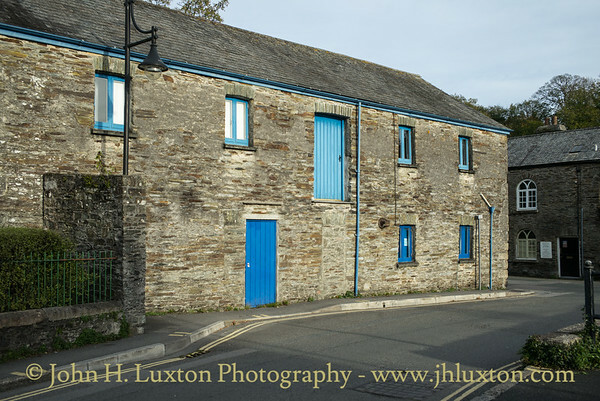 These adjoin the granary warehouse - extreme right. 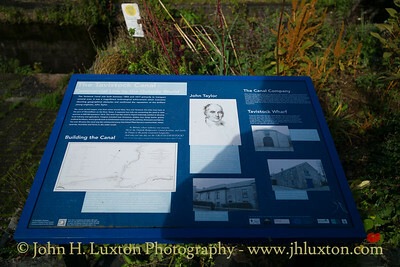 Interpretation board on Gill & Company's Wharf which features a portrait of John Taylor the canal's engineer.